People who live, study or work in the Sherbrooke borough of Lennoxville were looking forward to the completion of a highway extension, scheduled to open near the community shortly. 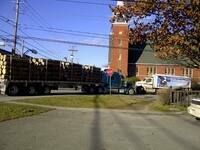 At the moment, large trucks and heavy traffic runs through the town. Now Quebec's transport department says the portion of the highway that would curb some of that traffic won't open until 2015. Lennoxville borough president David Price joined us in our Sherbrooke studio to tell us more.